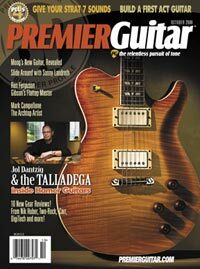 October 2008 - "Extraordinary innovation hits the Guitar World today. The AxeGlove is designed to protect your favorite guitars against belt buckles, guitar stands and guitar hangers by using a washable, two-piece neck and body system made of double layer cotton flannel as a buffer. The AxeGlove comes in shapes for Strats, Teles, Les Pauls and SGs. It is designed to allow players to jam with the AxeGlove on their guitar, and also has a “Pick Pocket” to store extra picks...and it's Made In The USA!" October 2008 - "The AxeGlove protects your guitar while you play it. PERFECT!" Axe And Ye Shall Receive"
"Hey, left-handed guitarists. Lemme axe you sumpthin'. Does it chafe your axe to forced to pay more for a smaller selection of models when shopping for your next six-string? We'll bet it does. LightWing -- makers of the AxeGlove -- feel your pain. That's why they've taken the opportunity at Summer NAMM 2009 to announce that they're offering left-handed versions of ALL of their AxeGlove Guitar Protection Systems, and at the same price as the right-handed versions. Not only that, but they've upgraded the AxeGlove to the AxeGlove II. . . and again, lefties are equal beneficiaries. They've got a big tent over there at LightWing. What is the AxeGlove you ask? Why, it's none other than the Premier Guitar Protection System that you can keep on while you play! AxeGlove is a two-piece guitar wrap made from a double-layer cotton flannel material. This fabric keeps your guitar's finish nick-free, but also wicks away sweat and other moisture to keep nitrocellulose from developing warps and cracks, even if you're a sweaty beast like Blues Traveler's Chan Kinchla (who started playing Modulus guitars for their non-organic neck materials after discovering that his more abnormally acidic perspiration was destroying all his other guitars -- true story). AxeGlove comes in 11 different models, each with a right- and left-handed option. There's an AxeGlove for Gibson SG, Les Paul Standard, Custom, Deluxe, Double Cutaway, and ES models, PRS Single and Double Cuts, Fender Stratocaster and Telecaster guitars as well as Precision and Jazz basses. As the AxeGlove was made to stay on even while you're playing your guitar, it features a little pocket -- the PickPocket -- for storing picks and anything else you might need onstage and on the fly (laser pointer)." October 2008 - Gearwire Scoops The Industry! In Australia...Shrimps And AxeGlove' On The Barbi!